Sugar skulls made by Susan Schwartz from the website sugarskulls.com. 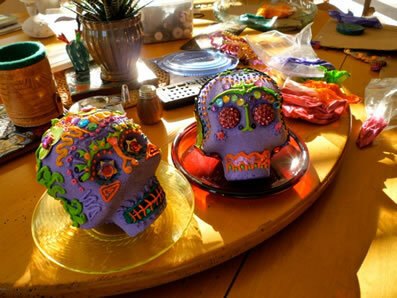 As someone long obsessed with Mexican sugar skulls (note the name of my blog), I was stoked to stumble across this site that shows you how to fricken make ’em. We’re talking detailed recipes for the skulls and the icing plus a variety of handy-dandy tips and activities for classroom teachers. Elsewhere on the site, you can buy a variety of molds for forming sugar skulls, decorating supplies and even some way-cool Dia de los Muertos socks. Definitely worth a look if you don’t mind dirtying up the kitchen. Sugar skulls, or calaveras de azúcar, are traditional folk art from Southern Mexico used to celebrate Dia de los Muertos, or Day of the Dead, which occurs Nov. 1 and 2. People use the skulls, along with marigolds, candles, incense and favorite foods to decorate home altars and honor their ancestors. This entry was posted in Uncategorized and tagged calaveras de azucar, Day of the Dead, Dia de los Muertos, sugar skulls by sanford. Bookmark the permalink.